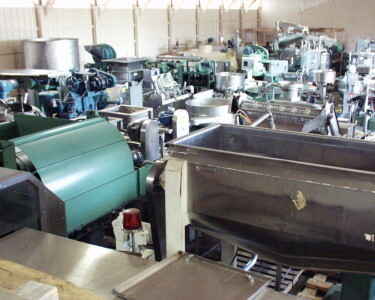 Partial LIST of used food processing and packaging equipment available from ALARD EQUIPMENT CORP. Supplying used food processing machinery since 1952, with over six warehouses of used food processing equipment IN STOCK! This listing of items you will find (below) is just a portion of the equipment we have in stock and/or available for sale elsewhere, SO, if you do not see what you need here, PLEASE CALL us at 315-589-4511 ; --we may have it in stock, or be able to find it for you! Want to see ONLY WHAT'S NEW? CAN SEAMER / CLOSER- auto, steam, ANGELUS, Mod 10P, set 209 dia low can, steam flow, random disk infeed, excellent condition (Y2664). CONVEYOR- screw, elevating 12" dia, 15'L auger, 27"x32" deep feed hopper, 8.5' discharge ht, USDA sanitary SS, Weiler 12SC, VG operational cond ready-to-go. (Y4118). PUMP- SHEAR: See "MIXER- SHEAR" above. Look for the "alphabet" (see below) and click on the letter of the alphabet to jump to the part of the list you want to see.